Many of you are squeezing more than 2.5 kids into 2.0 spaces. Right now, we're using the Arm's Reach Mini Co-Sleeper Bassinet for John--and loving it! We bought it because it holds up to 24 pounds (as opposed to Graco's 15). What I didn't realize: its narrow design would free up our bedroom walkway and fit through every door frame. When I wondered if someone's snoring might be waking John, I started rolling the bassinet into the living room at night. Problem solved! Do you have a creative or frugal way to make room for baby? Leave your idea or link in the comments below! What sweet little ole head...ahhhh! What a great find! We have always used a Porta Crib which are usually rated for up to 50 lbs. although by 6 months, my babies were all too long for it. 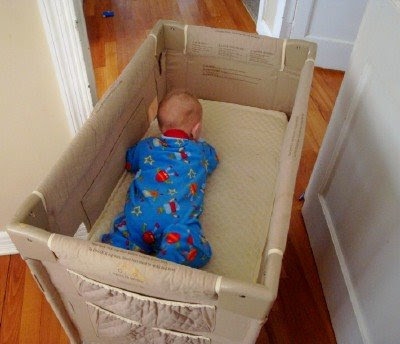 It is a nice way to keep baby close, move him around and not have to scoot the toddler out of his crib too soon. Wow! Someone's getting big over at your house! He's as cute as can be! That little guy is beautiful. Growing so fast. I read of how people are thinking their homes are so small. It makes me remember growing up in a 'trailer house' or mobile home as they are called now. Talk about tight....see 7 people in a 12X60 space. We were lucky to go outside to change our mind. My brothers slept on the sofa bed in the livingroom, my two sister shared the 'big bedroom' and I had a room to myself as I was the oldest. It was so small that as a teen I could stand in the middle of it and touch both walls. As I had a room to myself I had my brother's clothes etc. in my small closet. But, it makes me so happy for the home I have now. No it is not huge, it is not new, but it is almost mine. (owe less than $8,000.00 on it) There is enough room for us. We have a 2 bedroom house. When my ds was born I didn't want him waking sister up by having them in the same room and yet I cannot sleep with a baby in my room (light sleeper). So we had a basinette that he slept in in a corner of the living room at night. For naps I could put him in his crib in the shared room with sister. Eventually he was sleeping through the night so he went into the same room with his sister. For a time we had a portable room divider type thing that we put between her bed and his crib just to lessen the distraction. Eventually the kids got the two bedrooms upstairs and hub and I made our bedroom/office down in the basement. I too sometimes compare things to the 1800s and how they were able to live. When I'm feeling badly that the kids don't have enough friends to play with or wonder if they have enough toys etc. I remember what all the pioneers had (or didn't have). We are using a Mini Crib this time. My 2 year old is still in the big crib, but we don't have a room for this baby, so he's in a make-do closet room. The mini crib was the perfect solution for us! By the time he's too big for it, 2 year old will be out of the crib hopefully! It's amazing what you can do with a small space!!! I forgot to say in my first post what I wanted to tell you. (getting old) When my first son was born we were in the military. My husband was in flight school in Pensacola, Fl. We lived in base housing; at the time a one bedroom apartment. There was a large bedroom with 2 walk in closets. I took the rods down in one of the closets, painted the walls blue, and slipped in his full size crib and a tiny thrift store table to hold diapers and a lamp. His dresser and my rocking chair were in the bed room...we lived with this for 2 years. Not bad at all. It was very cozy. We have had several of our children sleep in pack and plays for extended periods, when things were tight. I think they are actually pretty great. I do like that the one you mention is narrow, because ours is so wide you have to break it down to move through the door, which can be a pain. Oh my, he's getting big! I would think that at six months he would be sitting alone and the bed looks much too shallow for one sitting up. I guess whatever works. I had thought that he shared Elise's room. Seems that I remember a post about doing his nursery when you where pregnant with him. I had three children in a 3 bedroom house, and it really was no problem at all. When the first two were little, we had a two bedroom house. Both were in cribs and shared a room. I think it's all about making do with what we have. Thank you for recommending this! I have to get something for our on-the-way baby since big sister still needs the crib. This looks very practical! We skipped the crib altogether. Both of our kids have slept in a basic Pack N Play from birth. It is the basic $50 model, but it does have the "bassinet" feature. We moved our daughter out when she was 2 (she got too long for it!). I asked my pediatrician if he could make an argument in support of using a crib, and he couldn't come up with one. It is much cheaper and more portable than a crib! Your posts are great. I love catching glimpses of what is happening with your family. We have one of those too. It is handy to have the baby right next to the bed when nursing. Exclusive breastfeeding for 6 months, cloth diapering (most of the time) and not buying prepared baby food were my biggest money savers. Now to read all the other suggestions... we are making room for baby 2 right now! I plan to put the twins to bed in the play n pack together for the first few months, and then both will go into 1 crib together. Our home is a 4 bedroom, but we gave up on living space to have that 4th bedroom. One bedroom is currently the room with the TV, sofa, and books. That room will become a bedroom/playroom, and our tiny living area will be crammed with sofa, loveseat, tv and more. We may have to get rid of the recliner, and move the glider to the twins room. It's all an adjustment, just like the move to a larger vehichle that can carry us all, but we're happy to make it for our coming babies. We also live in a small two-bedroom apartment and have two children. When my 2nd daughter was born, my older daughter was 2 and a light sleeper. I didn't know what to do because they eventually had to share the same room. However, I finally did what it sounds like a lot of people posting here did. I put a pack & play in the dining room and had my baby sleep in there for a long time. Honestly, it turned into about 10 months or more (I can't remember now) because every month or so I'd try to move her into the crib in her sister's room (which she used for daytime naps) but they'd just wake each other up at night. None of us were getting any sleep on those nights. Finally, they just got used to each other and have learned to not be such light sleepers. I tell them this is a good lesson for someday in college when they have roommates who are noisy. I do have a hand-me-down crib in Elise's room, and John will move in there soon. We bought this bassinet because we were expecting a c-section (9.9 lb baby, but came naturally instead). The full size crib has very high rails which are not adjustable. I didn't think I'd be able to bend over after a c-section. He has plenty of room to sleep and roll around. I don't let him lie there for entertainment. Great idea! I don't have any suggestions, as we're past that stage & happened to have enough room when the boys were babies. Love that sweet baby head! I should say, I didn't *have* to buy this because of space issues--but its narrow size has made this so handy in every way, I wanted to share it for those friends who are fitting several children into small homes, or fitting that first child into a 1-bedroom apartment, etc. Not all large babies are delivered by C-section. I have a two year old granddaughter who was over 10 lbs. and a grandson (12) who was over 11 lbs. Both were delivered normally. I guess I am just used to big, active babies. My granddaughter had a large cradle made for her by her grandfather, but she never slept in it. It was brought into the living area, and she spent some of her awake time there for a short while. She was soon much too large to be comfortable. I can't imagine twins sharing a pack and play for any length of time, or sharing a crib once they start turning over. It seems to me that they would be all over each other! If it works for you, then go for it! I am pregnant with our fourth child right now, and my creative/frugal ideas have been the same with all mine. One thing that definitely makes my life easier/less expensive is that I have all boys...so we can reuse all (ok, most. they are hard on them!) clothes, toys, etc. I (mostly) cloth diaper, make the baby food, and nurse. Those three things save a bundle. Right now, our oldest two share a room, and the toddler is still in the nursery. Our newborn will sleep with us for about 6 months, then he will go to the nursery, and the toddler will join his older brothers. The boys room is the biggest in the house, with three twin beds in a row. I always joke that if we keep having boys, we can eventually replace the twin beds with 3 sets of bunks and sleep 6. :) Our house is about 2100 square feet. I wouldn't call it a small house, though some would. I plan/hope to stay here forever, regardless of the number of children we have. Like someone else said, their bedrooms are basically just for sleeping, so as long as everyone has a bed, they are set! I wish they would have had that when my kids were little. I have the Bugaboo stroller/ carriage. When my son was first born and for the first 6 months, I used the bassinet part of the stroller. It snaps right out of the stroller, so that it acted as a cradle in my bedroom or anywhere in the house. I never needed to use the cradle or buy a separate bassinet. It's a great space saver, especially for those living in a city. When you are out for a walk or in the yard, if the baby falls asleep, just snap the bassinet out and in the house you go, without waking the baby. Not one to be able to help much with this one.....Parker is truly a million dollar PLUS baby! oy! LOL! Porta cribs are narrow enough to go through doors and can hold more weight, but the rail only lowers a bit for someone short like me it's a long reach to put the baby down and the mattress that comes with it is quite thin. When my 2nd wasn't comfy there anymore at around 8 months I moved him to a mattress on the floor in his brother's room (with an edgeguard). We also have a traditional style pram (Emmaljunga, sometimes available on CL in the $75-125 range) that we used as bassinette downstairs and it was longer and sturdier than the Kolcraft bassinette, and definitely more multi-purpose. Our babies always slept in the walk-in-wardrobe for the first few months...until they slept through with a degree of certainty and then when I got around to sorting out cots for them. It worked well for us and baby had a quiet dark 'room' to sleep in that was nice and close to me at night. wow! my little one slept in a laundry basket. very cheap. very portable. in fact, he wouldn't sleep in a crib or pack and play. the only places he slept were my arms and his laundry basket. my husband and i used to joke that we'd have to get one custom made to be big enough for him if he kept it up, but he began transitioning to a crib at about 7 months, just the time we were unable to find a laundry basket big enough! i'm due next month with my second and plan on laundry basketing this one too. it worked so well for Mr. Pants. The laundry basket is a new one to me! My daughter slept in her carseat for 8 months - those tiny, infant carseats. It's the only place she would sleep. We kept our third in our room for a few months, had sisters share a room for a few more months and then turned a screened porch into a bedroom. Now everyone does have his own space but not everyone sleeps in his own room each night. Funny how that works out. -loaned cradles and moses baskets. I swear, if you put the word out that you need something for your baby, in no time you'll have cradles and other things literally landing on your doorstep. I think people love to see their baby things well-used by people who they know will take care of them and appreciate the gesture. My brother slept in a dresser drawer beside my mom's bed for a month until my dad had time to finish the crib he was making! Ultimate in frugality lol. I like the rolling aspect. We were given a bassinet and a crib by family members that met safety standards so used those most of the time. My youngest had some bad bouts of croup and I loved the vibrating bouncy seat for that-kept him a little more upright which helped with breathing. The more children I have, the less and less I think babies (and kids!) need. This idea may have already been shared. We turned a walk in closet into a baby room that my daughter used until she was 4. When my son was young we needed to give him his own space and took a laundry room area we were using for storage,after we moved the laundry room into a small addition we had built, and turned it into a room for my son. It was just big enough for a bed and a chest of drawers. We decorated it and painted stars on the walls and ceiling with glow in the dark paint. He loved having his own cozy little space. It was also a favorite place for almost everyone to catch a nap. Thinking outside the box is essential when you have a large family and a small space. My SIL had 9 children. Her oldest kids took the attic in their home (unfinished) and with salvaged materials turned it into an awesome room for 3 of them to share. They even put a fire pole in for quick exits. I was so impressed with their creativity and willingness to make do. When the house seems too small just remember the saying: Love grows best in small houses. I believe it. What a sweet baby! I don't have any idea to share just a praise report. We live in an 800 square feet condo as a family of five. Many days I feel like we are the "little house on the prairie" in modern life! LOL! When we walk in from the front door, the first thing you see is the dinning table - just like "the little house" movie. :) Less is more definitely is the concept I embrace in our home. where there is a way there is a will and where there is a need there is a way. When I was a baby my parents moved in with my grandparents to care for them. Grandparents had the bedrooms upstairs for living space, my parents and two sisters and I had the living room, dinning room and kitchen. My parents slept in the living room on a fold out sofa, my crib and my sisters beds were in the dinning room with the table in the middle. We worry too much these days about having perfect looking places with nothing out of place, and children and their beds are NEVER out of place in my mind. Small spaces, with cribs placed simply where they fit are the norm in Europe and certainly they were in the pioneer days here.